OK, so I finally watched Redskins-Cowboys, which wasn't a professional football game so much as three hours of grown men writing Tony Romo's name all over their Trapper Keepers. Is Romo now on that Favre-ish plane of existence where everything he does gets accompanied by cherubim and harp music and Ed Werder? Romo played OK in a game where everyone else was lousy. (Granted, his 3rd-and-21 conversion, wherein he was forced to scramble up to Jerry Jones's luxury box to avoid a kitchen-sink blitz, was legitimately great.) ESPN gave us at least four replays of London Fletcher bopping Romo and his bad rib to the ground. It reminded me of those old Westerns in which the same stunt man would get killed three or four times in the course of a Comanche raid. 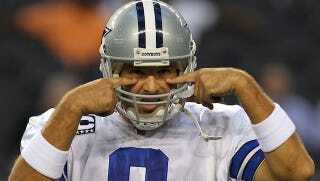 Romo is a made-for-TV quarterback. He knows how to mug for the cheap seats. He knows when to smile, and he knows when to wince. He does theatrical dissatisfaction better than anyone not named Kobe Bryant. At one point, the camera caught him gesticulating at coach Jason Garrett's laminated play card, and Ron Jaworski immediately launched into the beatification rites. "Romo's doing it all tonight," he gushed. "He's been a coach on the field." Of course, for all we knew, Romo was talking about last week's episode of Nova. (Besides, all I saw was Romo haranguing his teammates, in particular poor Phil Costa, the center, who it turns out was getting his radar scrambled all night long by the Redskins. Here's a thought experiment: How would the broadcast crew have reacted if Dez Bryant had been doing that kind of coaching on the field?) I think it was around the time that Jon Gruden started dropping unrhymed couplets that I realized we're in for a long year of heavy Romo love. "Romo might have bad ribs," he said. "But there's nothing wrong with this guy above the neck." Oh, gross. You could see that second line coming from Amarillo. More interesting than the game itself was how I watched it: online, in an hour or so this morning, moving through all the slack parts in 10-second bursts. This year, I decided to shell out $30 for NFL.com's Game Rewind feature, which offers broadcasts of every game free of commercials. You can cue up a specific play—which is what I did with that comical Blaine Gabbert interception Josh mentioned yesterday—or you can watch the game as you normally would, skipping through huddles and timeouts with the 10-second-jump button. I know the crew at Football Outsiders has already put the video tool to good analytical use. And now it seems that coaches are partnering with Rewind and finally handing over pieces of their much-coveted "all-22" game film, which shows everyone on the field (as opposed to the network broadcasts, which only follow the ball). My complaint about televised football has always been that we see such a small fraction of what happens on a given play, and that that small fraction is a distortion at best. When we watch a live broadcast, we're almost totally at the mercy of the broadcasters' intelligence, the analyst's choice of emphasis, the producer's choice of replay, etc. All that priestly mystification in the broadcast booth—the fatuous talk about Romo's guttiness, say—is partly a function of football's speed and width, of our seeing only a sliver of the action and requiring an expert to explain it in the first place. On Rewind, you can slow things down and back up. Different things jump out at you. Alternate narratives suggest themselves. The game leaves the realm of the gut and moves, you might say, above the neck. I know you're a Rewind junkie, too, Ta-Nehisi. Has it changed football for you at all?